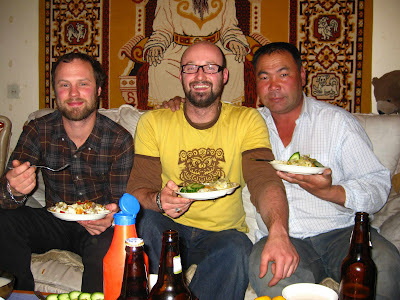 10 days after I arrived in Mongolia, I surprised the Mongolian family whom I lived with the first time I was working on Mongolian Bling to discover that Jama, my Mongolian father, had passed away last Friday. Over the month I stayed there, we became great mates. I spent shin jil (new year) with them, visited them during the Mongolian new year (tsaagan sar) and even braved cooking them something that wasn’t made of mutton, potatoes, onion and flour! Jama was always up for a laugh and a game of sheep knuckles, taught me the ins and outs of sumo and, despite not knowing a word of English, never failed to chat endlessly to me. Fiona was lucky enough to visit the family before I left and we had a great time – Jama, only able to pronounce Piona, resorted to renaming her Namuna. When I arrived the other day, I had with me a wooden elephant that Piona had got in Afrika and given to me to give to Jama – his living room was full of model elephants, and when I gave it to Dosma, it was blessed then placed next to a portrait of Jama which looked out over the room from the top of the cabinet. A blue scarf was draped over the picture. A candle burned, and Buddhist chants crackled out of a radio that appeared to play the hypnotic hymn endlessly. When Otto, Jama’s younger brother walked into the room, the mood instantly lightened. He started making fun of me, made us drink airag (fermented mares milk) by the bowl full, told Steve that he would come back to the countryside to marry his daughter, and offered to teach me how to wrestle! He reminded me so much of Jama with his infectious laughter and lust for life. We had a meal with the family, and recalled many of the great times that I had shared with Jama and the family. He even appears at the very end of the Mongolian Bling teaser in the section titled Mongolian Culture. 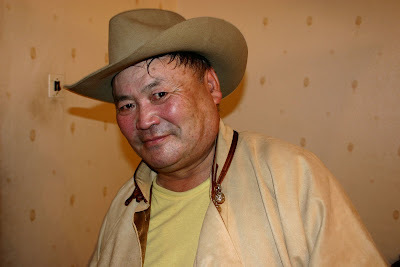 He really was an image of Mongolian Culture. After a few hours of catching up, Steve and I left, receiving a hug from Otto, and blessing from Dosma. Jama died of a heart attack the day after I arrived back in Mongolia. Every visit to Mongolia will not be the same without a visit to him. Jama, all my love.